This back-to-school special contains three 48-cards decks: One each Single Digits, Double Digits, Variables. A $33 value. 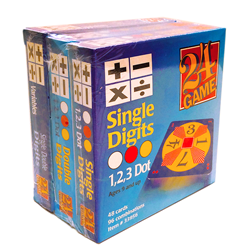 How to play Single Digits & Double Digits. Object of the game is to make 24. You can add, subtract, multiply and divide. Use all four numbers on a card, but use each number only once. There is at least one solution to every card.